Fun, fast and funky cowl kits. 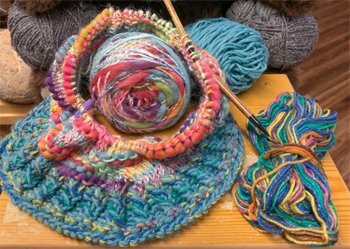 Using blends of thick and thin yarns and and easy stitch technique, this easy project is quick to knit up in a few hours! Choose the happy colors of Lollipop Forest, Sing along with Bluebirds R Us or relax with Posy Power. Sure to be a hit!